Trends are wonderful and fun, but when it comes to wedding photos, most couples want a timeless elegant look that will become a family heirloom. 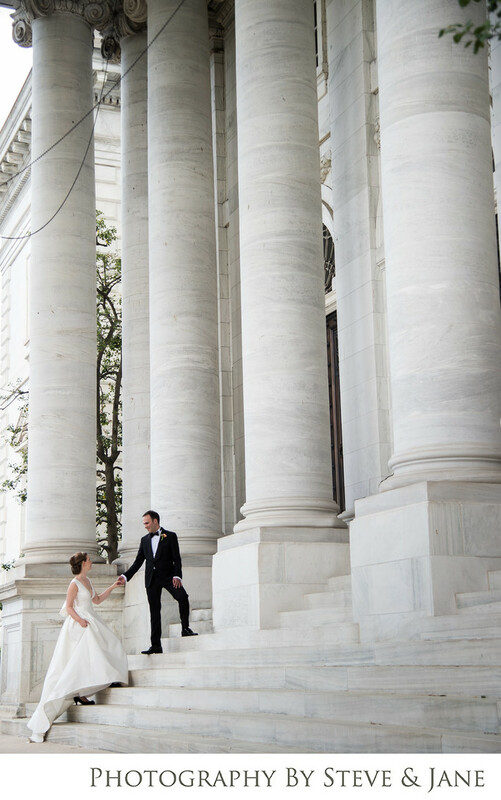 This couple chose DAR Constitution Hall as the backdrop for their classic DC wedding. Stately marble columns and a dramatic stairway entrance give these photos that look that district couples love. The bride chose a Carolina Herrera dress with a simple and elegant design and added a dramatic bow and train to make the look her own. The groom, in his perfectly fitted tuxedo, exudes the sophisticated feel that DC grooms are known for. Location: 1776 D St NW, Washington, DC 20006.